In a post on the winners of the SND 31 competition over at the Infographics News Blog I found the below diagram on the President’s Budget. Originally published by the Washington Post it has won an Award of Excellence in the 31st edition of the Society of News Design contest in the Infographics / Breaking News section. 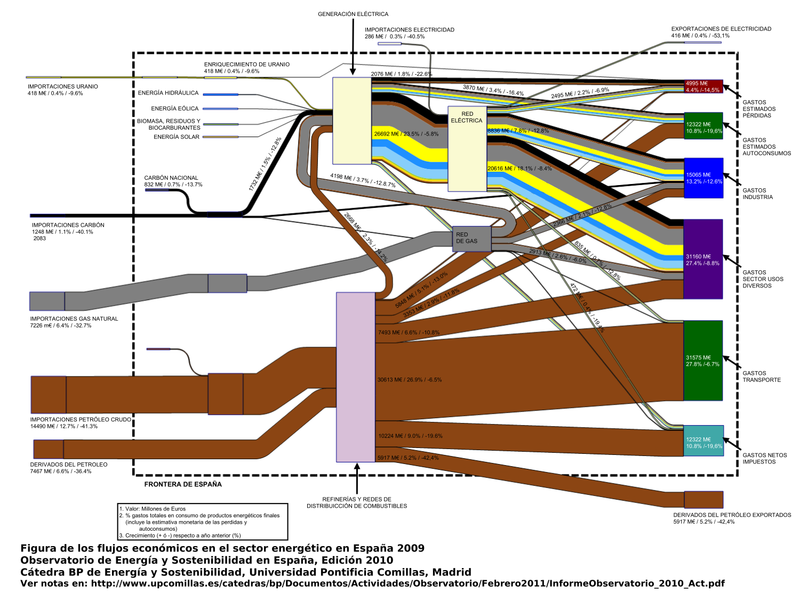 It is not really a Sankey diagram, since the arrows are not explicitly directed. But it has weighted arrows/bands, in this case representing $$$. This infographic was maybe inspired by this one from Spain that was – after lengthy discussion – named a “distribution diagram”. 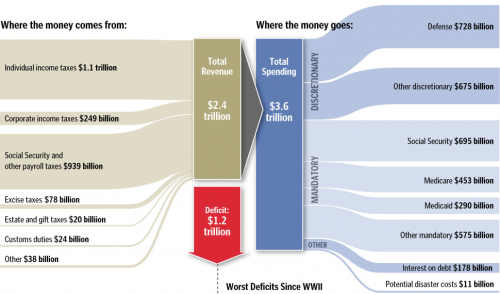 I cropped the lower part of the infographic that had details on the deficit as bar chart. See original, full infographic file here. Comments Off on President’s Budget Revenue/Spendings	Tags: money, U.S.
A tiny example, but fun to see: income statement, apparently for a webhosting company. 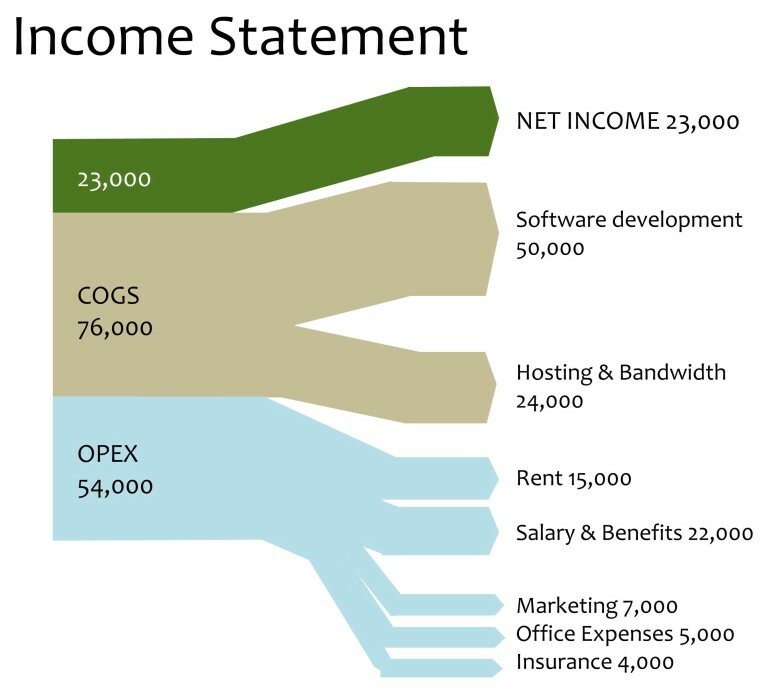 Operational Expenses (OPEX) in light blue, cost of goods sold (COGS) in light brown, net income in green. No currency given, I think this is just to convey the idea of “money flows” and to give an idea how data can be presented other than in tables. This is from a post called “5 exciting alternatives to boring power points” at Speaking Power Point. The detail shows though that even if Sankey diagrams are “sexier” than tables, you still need to pay attention to the details when drawing them. This one was apparently made in Power Point by joining shapes and arrows. Which wasn’t all that successful in some places, as the detail shows. 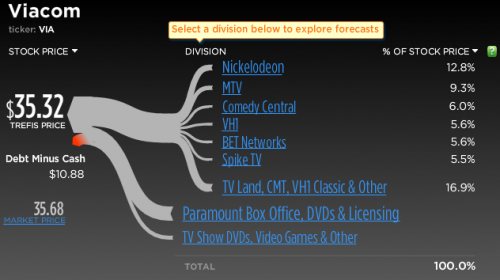 Would have been better to use a Sankey diagram software. 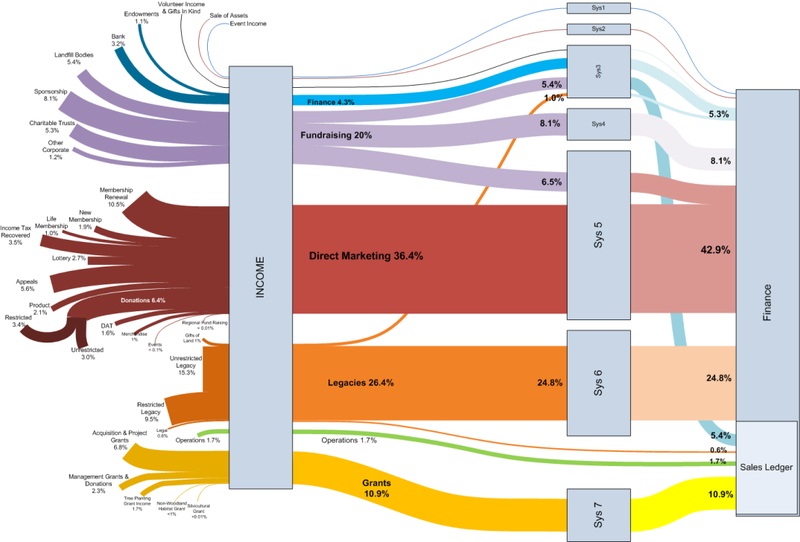 I recently discovered Trefis and their Sankey-style diagrams as a visualization. Trefis models are used to determine the target stock price for companies, by looking at their product portfolios and playing around with the expected growth rates and market shares. 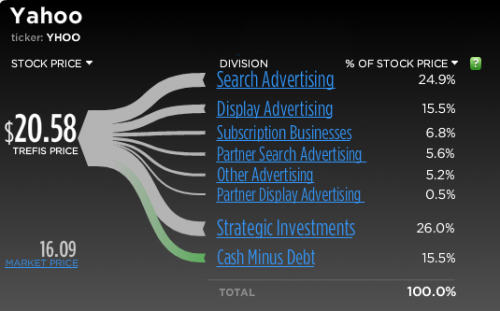 Well, there is a whole model behind these interactive graphics, but the interesting part is that the share of the companies turnover is broken down by products, and is shown with proportional Sankey-like arrow magnitudes. At the tip of the joint arrow head you can see the target share price, which is calculated as “the result of mathematically combining all of our forecasts for a company into a single number representing the per share value of the company.” When playing around with the parameters, this value will adapt accordingly. Forbes, techCrunch and the New York Times all reported about what the latter calls “America’s Next Top Stock Model”, but none of the mentioned Sankey diagrams though. The Visio Guy had another cool Sankey diagram on his blog last week. Credits go to Chris Webb of Woodland Trust, who created this using the line thickness option rather than pre-wired shapes. The diagram has a left-to-right orientation and shows the different sources of money received by the trust. The types of funds (e.g. grants, legacies, direct marketing) are grouped together by colors. Flows have percentile values, rather than absolute ones. I am not sure what the boxes labeled “Sys” are, but the colors change. 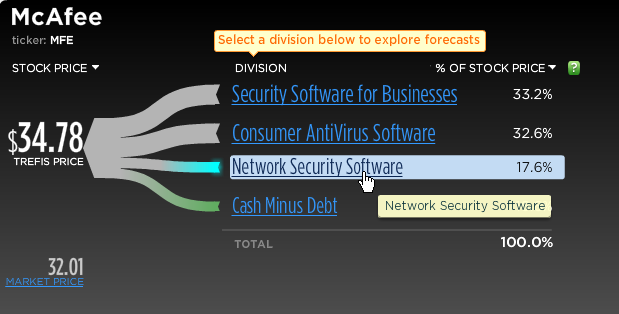 All flows merge into the box “Finance” which has a subgroup “Sales Ledger”. The flow bands between most of the nodes have a nice soft curving. This is why some people do refer to Sankey diagrams as spaghetti diagrams. If you are using Visio, you can download this diagram and look how it has been done. Nice work! I hope to see more of these Sankey diagrams done in Visio…. Following yesterday’s post with the translation of a blog post by Chiqui Esteban from infografistas.com here is the translation of the post “Caudales, erogación… ¿flujo?” of April 5, 2009. Again, I left some words in Spanish in square brackets. A new chapter in the discussion [polémica] about the ‘scientific’ name of the “little arms” graphics [‘gráficos de bracitos’]. 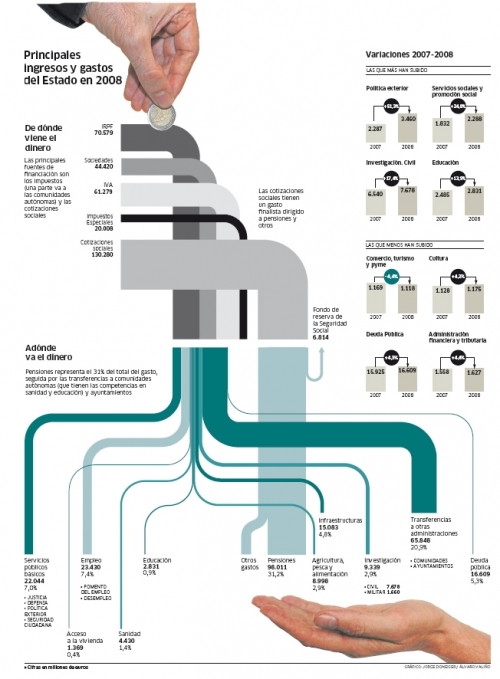 Xocas came up with the name ‘volume flow’ diagrams [‘gráficos de caudales’] and my vote was for ‘distribution diagram’. 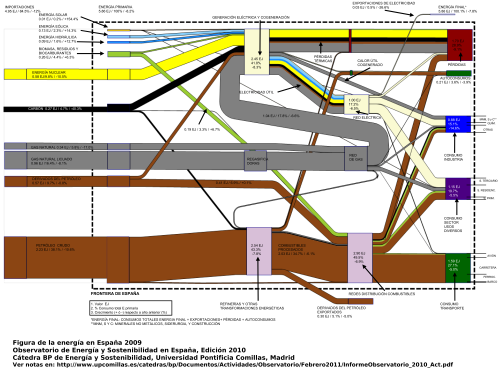 Other suggestions were thrown in: Xoán G. made reference to Minard and his ‘capacity diagram’ [‘gráfico de aforo’]. Herminio J. Fernández voted for cosmography diagrams [‘cosmografías’] as refered to by Stovall [Infographics by James Glenn Stovall, Allyn&Bacon, Massachussetts, 1997]. Many others voted for ‘flow diagrams’ [‘gráficos de flujo’], although Xocas discarded this suggestion because “the term flow diagram normally refers to a very specific type of visualization of process [flows]. It could be used as a generic term, but has interference with another model”. “According to Harris (Information Graphics) and Bruce Robertson (How to make Charts and Diagrams) these graphics are called flow diagrams, and are of the type in the same category which are used as decision diagrams in informatics [computer science]. The latter are more in fashion now [Por motivos de modas], but the former have always [sic!] existed (a historic example is the one of Napoleons troops)”. I hope I got it more or less correct. It is not easy to find the right translation for the sometimes subtle differences between the terms. For those of you who can read Spanish, please check out the original post and the full discussion thread on Xocas’ blog. The post is decorated with this beautiful Sankey diagram. 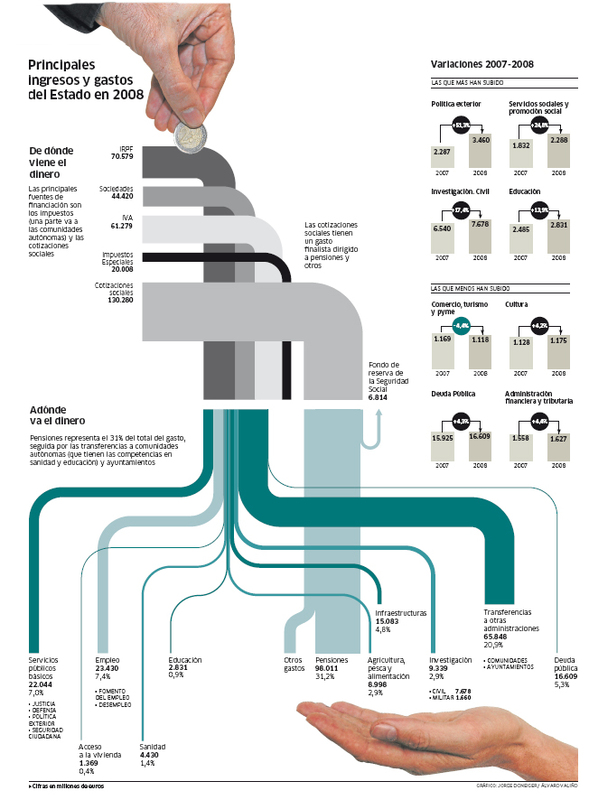 It shows the main earnings and spendings of Spain in 2008 and was produced by Jorge Doneiger and Álvaro Valiño for the daily newspaper Publico in 2007. 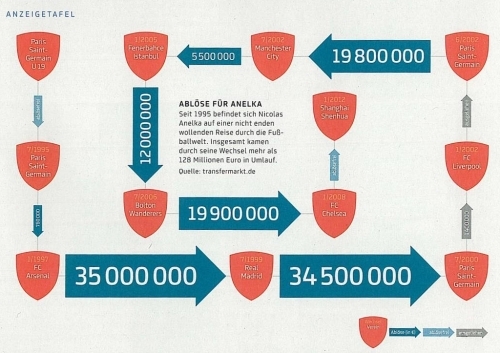 Values are in million Euros. Flows are not always to scale as for as I can see: the ‘impuestos especiales’ in dark black and the ‘deuda pública’ (at the bottom on the right side) are examples. The top part shows the sources of funding, the bottom part the beneficiary sectors. 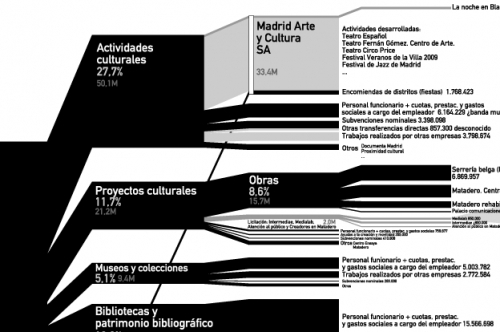 The fact that the stacked width in the middle is wider than that of the funds distributed suggests that the Spanish state is actually piling up its money, but probably this has to do either with the list of recipients not being complete, or with earnings received in 2008 but not distributed in the same year. Note (Aug 19): A case of DYRF, do your research first! I just detected that Chiqui himself has an English version of his article here. So, now you got the choice between two versions!